Over the years we have received 100s and 100s of emails about our series. We have decided to share a few of them. Please note, some are LONG. Let your player watch the session….. then work the session. Imagine the TIME savings. have your players watch the session BEFORE you hit the field. Now, just go the field and PRACTICE what they’ve learned. It’s like hiring a technical trainer for your team. A private training session without the frustration. They come PREPARED to work and practice the skill, saving VALUABLE field time. Soccer Parents, Soccer Coaches, and Trainers LOVE this series. Socceru and Blast the Ball Reviews and emails. Please feel free to post this. I’m a soccer coach and a soccer parent. Now with players in the advanced programs and in high school. We started them on SoccerU years ago and it TOTALLY changed their “soccer lives”… TOTALLY. I want other coaches and parents to understand that their children and players will NEVER receive the type of training SoccerU offers in regular soccer practices or soccer camps. It will put them FAR ahead of other players if they actually study it and learn. I also want them to watch the previews and look at the QUALITY of the videos. I was in video production for years and this series is VERY well produced. Most others are not and don’t offer the LEARNING… that SoccerU does. I have 2 soccer playing children. Mark is a freshman in high school. He just completed a year of playing for the high school JV team and he will be playing on his first premier team later this fall. Jill is in 7th grade and she also just joined a premier U13 team plus she will be going out for the junior high team for the first time in the spring. I felt that both of them needed better technical shooting skills but I didn’t have the expertise to help them out. When I saw an ad for the “Blast the Ball” DVD, it sounded like it was exactly what they needed to take them to the next level. Also, now that they are older, kicking the ball against the garage door was not something we wanted them to do, so building the soccer hop rebounder (plans included with the DVD) is working perfectly. They have just begun working on the different techniques that the DVD covers because I didn’t want them to get too involved with any new ideas in the middle of their playing season. In the short time that they have been working on the kicking basics, I have seen a big increase in the quality of ball striking. The DVD is so full of information that I’m sure we’ll be referring back to it for years to come. We are the “95 AYSO Thunder”, and they are a terrific group of kids and parents. My assistant coach is hard working and a tremendous asset to the team and me. I am very fortunate to be associated with all of them. We just received Blast The Ball and have started to implement the techniques. It is amazing how valuable the changes have proven to be! We scrimmaged a boys team we who has beaten us every time we play them. This last weekend we finally beat them thanks in part to the techniques we picked up from your disk. As far as our team, we are a girls U12 team based in Charlotte, NC. The kids play at a recreation level during the season. In November 2007, however, my assistant coach and I invited these players to form a more competitive team. We started playing in a U12 boys indoor soccer league that same month. We had to play the boys teams because there wasn’t a girls division; we also thought it would be good competition for us. The first few games we got clobbered, but by the end we were only getting beaten by two goals. We continue to scrimmage one of the boys teams once a month and they kept beating us until the match I mentioned above. We compete in tournaments with club teams at the next competitive level or higher. In North Carolina, they are called ‘Challenge’ and ‘Classic’ respectively. We have played in one tournament so far and finished in the championship game losing 0:1 on a corner kick. We have two more tournaments this season (NC and TN). I am sure the girls will be very successful now that we have your video as an additional teaching tool. It should be mandatory viewing for all coaches at the youngest levels on. I have been coaching soccer for more than 10 years and wish I had it when I started. Thank you for helping me, help the kids. I have been coaching girls youth soccer for 4 years, and have twenty other training DVD’s but none compare to “Soccer U” and “Blast the Ball”. Coach V explanations are clear and right on point, well demonstrated with good coaching techniques that everyone can relate to. My two daughters, hated watching training DVD’s, but with “Soccer U” and “Blast the Ball” I come home from work (their on summer vacation) to find them watching Coach V. In just two weeks I have seen a marked improvement in their skills, techniques and attitude. Thanks, only wish I had these DVD’s years ago. A great email we got from a soccer parent like you. I hope you will share my comments with your readers that are soccer parents. I am a soccer parent and have two boys playing, one is 14 and one is 9. I played “some” soccer when I was young but never played at upper competitive levels. I have done my best to help my kids improve theirs skills over the past few years. It wasn’t until I found your series that EVERYTHING started to make sense. My children go to practice twice a week, for about an hour each evening. Within that time they mostly do drills and then scrimmage. There is a small amount of skill work done at the beginning of the season, but that usually fades away by week 5. We have spent many hours in the backyard and at the local fields working on skills alone and in our spare time. However, while these sessions are great for bonding, they never really produced any significant results. It seemed that we were just repeating the same bad skills over and over. A friend of mine told me about your series and so I took a chance and ordered it. After watching your series I was amazed at all I learned. Not just for my younger son but my older son as well. I started working with them a little at a time, section by section. We also returned to the basics and worked heavily on ball control, dribbling and kicking. It has been six weeks since I started working with them and the results are truly amazing. I now have become a “soccer teacher” because I understand the skills and how to teach them. That was my problem. I was trying to teach something I didn’t understand and know how to teach. They have started watching the series with me and it really has becoming a very enlightening process for us all. Both my sons’ coaches have commented on how much they have improved and asked who was working with them. When I told them that we were doing it at home, they were kind of shocked. I have even had other parents ask me if I would with their children. I will say this with the deepest conviction I have, if you are a soccer parent and want to help your child, get this series. You will improve their skills more in one year working at home than years and years of just playing the game. Just doing the “usual soccer thing” is not how players improve. This series will carry my boys all the way through high school and is the best investment we have made. I can’t thank you enough, from all of us. I have been around the game of soccer for over 20 years from playing to coaching in many different levels. This video breaks down every technique and process in teaching the proper kicking form. Not only youth players can take advantage of important information but players at higher levels of the game can use proper technique. For example, many soccer players are athletic and skillful but it doesn’t mean necessarily they have the science of the soccer kick or pass. “Blast the ball”, brings the knowledge and breakdown for every kick or pass. I have seen many videos that try to explain many different techniques, but “Blast the Ball”, will change and teach thousands of kids, players and coaches the proper form. Another important aspect of this video it can be taught in many different levels. I can honestly say by being a Div. One coach I can use some of the excellent information in coaching the proper technique to all my players, especially to all my club teams. “Blast the Ball” is without a doubt the one and only video that I would call a must own. I have played for the national team, played years of professional soccer, am currently coaching Division I college soccer and I can confidently say that I am better for having watched “Blast the Ball.” If the only way to own this video was to trade in every other instructional tape you own, I would honestly recommend it. No other video covers soccer with the clarity, knowledge and effectiveness of “Blast the Ball.” Making my living serving long balls out of the wide position, I wish I would have had the information contained in this video when I was growing up. If I watched Blast the Ball as a youth or in college, I am certain I would have had a more successful professional career. There is no better feeling than finding yourself in space and crushing the ball into that back of the net, and that euphoric feeling is the gift that this video is able to provide to players. Saskia Webber – Saskia became a member of the United States National Team at the age of 18. After a stint playing soccer professionally in Japan for Oki from 1996-1998, Saskia then went on to play for the New York Power for three years. Her nine year run on the U.S. National Team was punctuated by a first place finish in the 1999 World Cup, a gold medal in the 1996 Olympics, and a third place finish in the 1995 World Cup. Blast The Ball doesn’t miss a beat. Every way of striking the ball is covered and explained in a way that a beginner, intermediate or professional player can learn from. You don’t just deconstruct striking the ball, you break down everything from the parts of the ball, foot and swing to where your eyes, body position and follow through should be. I love the way you break down the swing path and striking point with the rope and marker….I have never seen anything so simple but so effective. There are so many “myths” out there and improper techniques. Blast The Ball is the truth and the right teaching tool. Having Blast the ball in your bag is like training every day with the best strikers in the world. It is the best training tool you can have. From the fundamentals of striking the ball to drills to help you refine it, Blast the Ball is something no footballer should be without. Goalkeepers beware, when the world starts to use the Blast the Ball system, our job is going to get much, much harder. 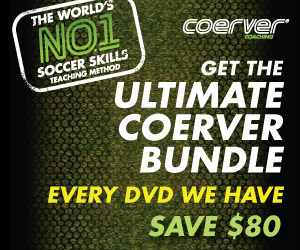 For many years the SoccerU and Blast the Ball series have been the best selling, most in-depth, and useful technical training series around. The DVDs have helped 10’s of thousands of players around the world, in over 35 countries. SoccerU and BTB took over 2 years to fully develop and create, and are 11 hours (yes eleven hours) of training. Every coach or soccer parent says the same thing, an amazing education that’s like getting a PHD in core technical and soccer skill training. It will help you SEE things (understand them) you would have never seen before. Times are changing… Coach V knows that more and more coaches and parents are using mobile devices, phones, etc, to watch videos and fewer and fewer use a “DVD players”. Also, coaches have wanted the ability to SHARE lessons with players, parents, and other coaches for a long time. Imagine being able to send parents or players a ‘weekly class’ or training session. They get an email from their coach… “Please watch this instruction video. We will be doing these drills and working on these skills at Wednesday's practice.” The players go through an online training session and are exposed to the skill training before they even hit the field. It’s AMAZING how this works. You’ll see the “light bulb” go on with so many players. Great for school coaches that can’t practice with players most of the year. Amazing tool for youth coaches that have VERY limited training time. You want to DO the drills… not spend your whole practice TEACHING the drills. Over the next few months we will be breaking down the series into 10 - 20 minute videos. Uploading to YouTube and allow people to watch for free. Coach V will also be creating indiviual pages for each video at SoccerU.com and adding helpful notes and tips below each video. Soccer clubs, soccer websites, coaches, parents, and all will be allowed to embed these videos on their websites, and share with whomever they wish. A great useful tool.